These markers are a must have if you are a fan of the Tim Holtz Distress line by Ranger. Having played with them a little bit at the Doo this weekend, I can attest that they are versatile and since they come in all thirty seven Distress colors, they will blend perfectly with your current Distress stash. Best used for direct stamping, coloring. 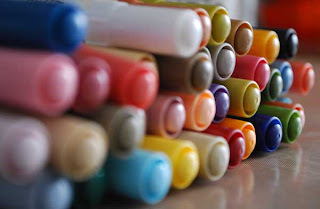 or even for journaling and writing with the fine tip, these markers blend well with other colors and are reactive to water for a more watercolored, artistic look. But do be careful if you journal with them (trust me! ), because if you wet your journaling after you've written, the ink will smudge (sadly I learned this first hand...). When I chose my colors, I was first going to stick to colors I knew I already had in my distress stash... but then I realized just how many colors were available and I had to branch out a bit. Because these markers will work so well with the distress inks, reinkers, and stains, it makes sense to choose colors that may add to your coloring options and compliment any distressed colors you currently have on hand. BUT I would definitely suggest picking up the Picket Fence white marker, because this one is phenomenal on kraft paper or colored cardstock and provides a crisp, clean effect. Whether you choose to augment your stash or compliment your existing color palette, I think you will be pleased by the range of uses available with these affordably priced markers. Can't wait to see what you all come up with! Happy scrapping! Great review Adina! Thanks for the tips and insight! I did purchase Picket Fence, Black Soot and Vintage Photo from THE DOO to start with. I had fun using the Black Soot to edge the chipboard pieces that will be included in The DOO's March Kit of the Month. SOOO FUN and EASY! I am sure I will be adding to my newly created Marker Stash too! Hmmm..... oh what color(s) shall I pick next to join the others?! LOL!